Radiometric dating of rocks may not be as black and white as you may think. Often, mainstream science mentions the results of radiometric dating in publications without mentioning that it may be off significantly of just plain wrong. They present this persona that radiometric dating is absolute, authoritative, not to be challenged, and always accurate. If you read closely you can find publications that mention how they had to date something numerous times to get the date they expected or that they had to try a different radiometric dating method. If you look you can also find information about the assumptions that radiometric dating uses. For example Wikipedia says the K-Ar dating requires five assumptions to be true in order for this dating method to be accurate. You may think all of these assumptions are very well established, but they will still always be assumptions. Just the thought of science using assumptions does not sound flawless does it? What if an assumption is wrong? How will that affect the results? Maybe radiometric is not so clear after all. "Due to the long half-life, the technique is most applicable for dating minerals and rocks more than 100,000 years old. For shorter timescales, it is unlikely that enough argon-40 will have had time to accumulate in order to be accurately measurable." This statement is not listed in the assumptions section, but is presenting one nonetheless. If this dating method is only for rocks older than 100,000 years, then it assumes that rocks older than 100,000 years exist. We should never blindly believe or follow anything. This has often been said towards the religious community, because of a perceived practice of brain washing children to blindly follow the religion of their parents. However, one can not apply a double standard here without being detrimental to Truth. Evolution is often taught dogmatically to the masses, regardless of whether they understand how science reached these conclusions. We are apparently just suppose to trust their conclusions, because they have Ph.D.'s. The obvious response to this is to say that dogmatic religious belief is not based in reality and dogmatic evolutionary belief is based in scientific fact (fossils, DNA, statistics, geology, dating methods, etc....). However, this is over simplifying the issue. Faith is required when accepting any worldview that makes significant claims about the unrepeatable past. Evolutionary evidence is not flawless and comprehensive. Therefore, anyone who can think for themselves should apply the same critical thinking process when accepting new knowledge. Whether this new information is or a religious nature or a scientific one. Whether it is verbally transmitted from a preacher or transmitted in writing through a academic text book. Main stream science appears to say that information should be accepted blindly if it comes from a text book written by highly educated people, but do not accept blindly things you hear at your church. Truth is absolute. Regardless of who says something or what form it comes in or what location it is spoken at, truth does not change. We must constantly seek to see if something we are told matches reality. We can and should consider the source of information, but it should not be the final authority. We must also critically analyze the claims to see if they matches reality and if the claims are reasonable given the knowledge that we already posses (hoping of course that we have not previously accepted false information that would distort our view of reality). Responding to violence: inaction or action which costs more? The president is correct that this is a tragedy. He is also accurate when he says, "no set of laws can eliminate evil from the world, or prevent every senseless act of violence in our society." However, he will probably act the opposite of what his statement says. Everything in life has pros and cons. Almost nothing comes without a price. Preserving liberty and freedom are very expensive. We pay for them with our lives on the battle grounds, with our time and money in political realms, and in many other countless ways. One way that liberty has a cost is that sometimes when we let someone make their own choice, they choose very poorly. Their choice can even do great harm and destruction to others. Laws exist for a reason to give consequences to people who choose poorly, but we must be careful when making laws. We do not want to strip freedom and liberty from people who make good choices just because a small percentage of people make bad choices. I am not saying we should always respond to these types of tragedies by doing nothing. I am however saying that sometimes inaction can be less costly than action. Obama implies that only inaction will have negative consequences and that action will always result in improvement. This is false. There is a cost regardless of that path our country and our leaders take. We can accept the risks of the liberties the 2nd amendment protects or we can remove some liberties in the hopes of creating safety and security. Both paths have expensive costs, but I prefer liberty (and I accept any risks that go along with it) over regulation any day. I believe we must protect our liberties and create a culture that encourages people to choose good over evil. I also believe the best way to do this to spread the truth of Jesus Christ. No other world view explains the existence of evil and provides a solution in a way that matches reality. Many people consider creation/biblical Christianity to be a "faith position", however I see all philosophical (i.e. dealing with origins, existence, etc..) viewpoints as "faith positions" to some degree. You may disagree with my perspective on that. Obviously some religions are much more faith based than others (i.e. Solipsism). In my opinion: a biblical worldview and any worldview that incorporates evolution and long ages, both require faith to some degree. Both views use the same evidence (or lack there of), with different interpretations, to draw their conclusions. Neither worldview can reproduce the origins of life on-demand in a laboratory to support their views. Every time there is a gap in evidence and extrapolation, projections, reasoning, guessing, or anything along those lines is used to explain what happened, then faith is necessary for the listening party to accept the view of the person making the statement. For example: One might read a book about two fossils that are similar, but different. The supposed changes that took place between those fossils is not recorded in the fossil record, but the book will probably still assert that there were transitional forms between those two fossils that we do not have records of. 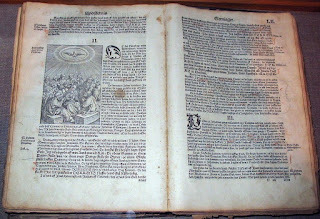 Depending on your worldview, one may consider this logical or reasonable to make this connection, however if the reader accepts this as true they are showing faith that the book is true even when it lacks the evidence to back up the claim. Science in general treats the word faith as a dirty word, however we all use faith every day. The real question is not which worldview requires faith. The real question should be which worldview uses faith in a reasonable, rational, logical, coherent, consistent, and realistic way. I posit that the biblical worldview does this better than any other worldview.